Did they worry about the speed limit in the 1900’s? In the early 1950's, some American car makers offered an unusual, and now quite rare, car clock option. Car clocks date back to early 1900's, when the invention of the motor vehicle was just revving up. We have in the Clapham Clock collection a very special car clock made by the Swiss company Maar. This company was contracted by the American manufacturers of the Oldsmobile car to produce a car clock that was mounted on the steering wheel. This needed a specially designed steering-wheel and horn ring, and as you turned the wheel, the clock would be wound up. The winding mechanism had two small plastic windows so you could look inside…cute eh! For their own reasons Maar made a steering wheel without the Oldsmobile logo, which simply stated “Automobile Car Clock”, and this is the one in our collection. Of interest is that the clock is attached to a spoke-mounted holder, which was designed to clamp onto the steering wheel. The standard clock as such has a long history and lineage, and by the mid 1800’s the Industrial Revolution was producing precision machinery for the changing technology with the arrival of steam ships, trains and factories. The First World War required another leap in technological innovation and precision engineering with further development of military vehicles and warplanes, that had the need for speedometers, tachometers and cockpit clocks. The great French clockmaker Edmond Jaeger established his company in 1880,and by the end of the Great War, both sides in the conflict were using his instrumentation, even the Red Baron! By the 1920’s, Jaeger turned to making dashboard instruments for automobiles, and produced high quality four and eight day car clocks. They developed a reputation for accuracy and reliability and were used by all the great car firms of the day, including Bugatti, Bentley, Citroen and Renault. 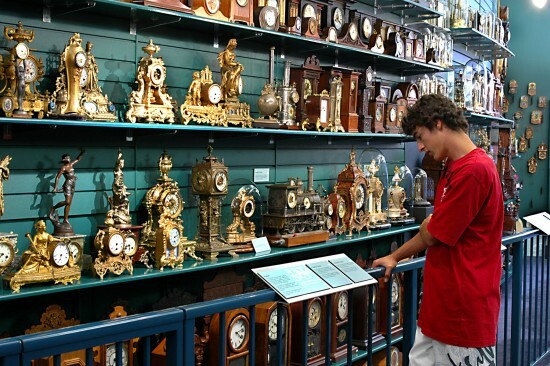 Another famous name in the manufacture of car clocks is Samuel Smith. He opened his jewellery business around 1850, selling also clocks and watches. In 1899 his son succeeded him and the company went into the business of making “Motor Watches” for cars and in 1904 produced its first speedometer. Early Smith automobile clocks are highly regarded by vintage car enthusiasts for their quality and movement, particularly the rim wind type. One of the reasons car clocks were built so well and so robustly was that they had to be. We tend to forget that the general state of roads in the early years of motoring were pretty dreadful, especially in winter. Some companies even produced car clocks with two main springs. Finally, along with coming to see us down at the Claphams National Clock Museum, you might like to visit The Packard & Pioneer Museum on Reyburn Lane , appealing to the history buff in us all! Become a Friend of the Museum today and get unlimited access to the museum for a whole year. Plus you’ll be supporting one of Whangarei’s best-loved attractions. Last night the hikoi in support for the Christchurch victims started at the clockmuseum and finished with a moving ceremony in Laurie Hall Park. We stand with the victims, their familes and their friends .